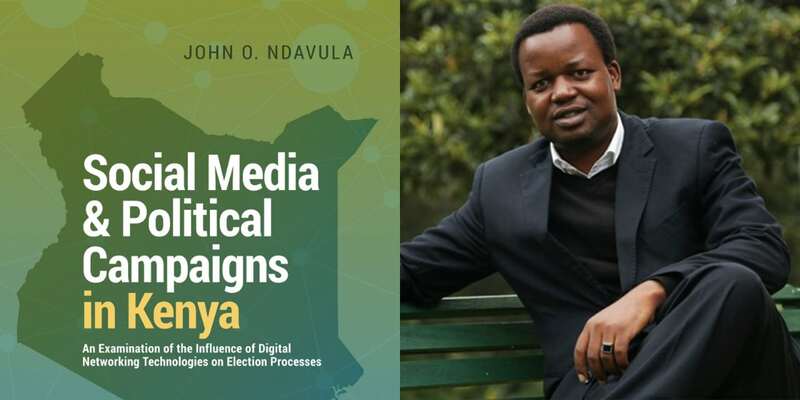 Dr John Ndavula, a Communication Lecturer and editor at Borderless Press has launched a new book on social media and political campaigns in Kenya. In his new book, Social Media & Political Campaigns In Kenya, Ndavula explores the relationship between digital networking and contemporary Kenyan politics. He addresses such issues as impact of social media on Kenya’s political landscape including the theoretical underpinnings for adoption of social media in political campaigns, practical implications for social media use in the political exercise as well as pros and cons of social media use in the democratic process. This is the first comprehensive study of impact of social media on politics in East Africa. The books comes at the wake of escalated use of social media to pass political messages. In fact, communication firms are venturing into the field of Social media marketing for both the corporate and political world. The biggest impact was felt in Kenya’s 2017 general elections, with Jubilee allegedly hiring the services of UK-based Cambridge Analytica to man their social media messages. According to a 2016 report by Nendo, The State of the Internet in Kenya , there are over 6.1 million Kenyans on Facebook, up by 1.8 million users registered in 2015. The number of monthly active users on Twitter stands at 2.2 million with a million daily active users. WhatsApp is estimated to have 10 million users while Instagram and LinkedIn are estimated to have 3 million and 1.5 million respectively. With such numbers on social media, no organisation or personality who wants to create a good public image can ignore it. According to data from SocialFlow, a social media management company whose software handles news dissemination for many of the USA’s top media organisations, Donald Trump has an unprecedented reach through tweets, shares, and likes. According to the company, in a year, the country collectively spent more than 1,284 years reading about Trump on social media. If he had sought similar attention by buying ads, Trump’s social reach would have cost $380 million (Ksh38 billion). Most politicians opt to use social media to pass their messages across, which otherwise would have cost them thousands or millions to buy airtime at the traditional media.